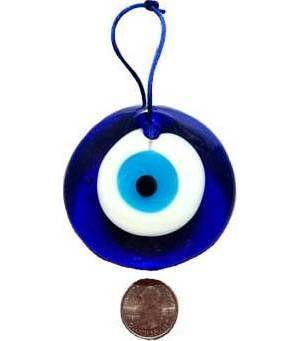 While keeping a watchful eye out for those casting the evil eye in one's direction, this traditional nazar blown glass eyed talisman is the perfect size to hang from a rear view mirror. May also be hung on the wall, above an entryway, in a window, on a door, or from whatever one may choose to help increase protection through the All Seeing Eye. This item is approximately 3 inches in diameter can comes with a cord.